It all started in the back of a Land Rover – a very appropriate place to begin an adventure. Graham was off on a holiday with wife, daughter, son-in-law and six-year-old grandson, James. This was not just a drive down the highway. Ahead and way into the distance stretched a road trip from Melbourne to Bundaberg. An arduous trip for an adult – even worse for a child, but he was equipped with a DVD player and ten movies to entertain him along the way. What transpired, however, was a storytelling marathon by Graham, spurred on by young James, who quickly discarded digital devices for the real thing. Twenty hours there and twenty hours returning, the stories continued – a hundred or more. These were not fictitious children’s stories, but real life events in what has been a life filled with adventure. 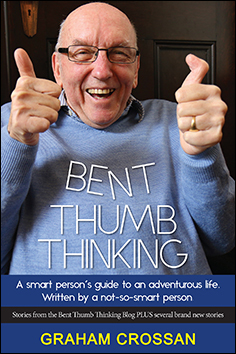 Converted into a blog entitled Bent Thumb Thinking, the stories are now being read around the world by thousands of readers. So, from that tiny world inside the Land Rover, where four people sat listening, laughing and occasionally shaking their heads in disbelief, the audience has expanded dramatically. The circle of readers now includes Australia, Asia, Europe, North and South America and Graham’s birthplace, Africa.